The Department of Homeland Security is facing major staffing shakeups with the resignation of Secretary Kirstjen Nielsen and removal of Secret Service Director Randolph Alles. This, as President Trump pushes for tougher border security. Want more from the show? You can get messages from our hosts (and more opportunities to engage with the show) sent directly to your inbox with the On Point newsletter. Subscribe here. John Sandweg, former acting director of Immigration and Customs Enforcement (ICE) under President Obama and a top aide to then-DHS Secretary Janet Napolitano. Politico: "Stephen Miller pressuring Trump officials amid immigration shakeups" — "As President Donald Trump roils the capital over illegal immigration, his influential aide Stephen Miller is playing a more aggressive behind-the-scenes role in a wider administration shakeup. "Frustrated by the lack of headway on a signature Trump campaign issue, the senior White House adviser has been arguing for personnel changes to bring in more like-minded hardliners, according to three people familiar with the situation — including the ouster of a key immigration official at the Department of Homeland Security, whose secretary, Kirstjen Nielsen, announced on Sunday that she is resigning. "Miller has also recently been telephoning mid-level officials at several federal departments and agencies to angrily demand that they do more to stem the flow of immigrants into the country, according to two people familiar with the calls." New York Times: "Kirstjen Nielsen Resigns as Trump’s Homeland Security Secretary" — "Kirstjen Nielsen, the homeland security secretary, resigned on Sunday after meeting with President Trump, ending a tumultuous tenure in charge of the border security agency that had made her the target of the president’s criticism. "Ms. Nielsen had requested the meeting to plan “a way forward” at the border, in part thinking she could have a reasoned conversation with Mr. Trump about the role, according to three people familiar with the meeting. She came prepared with a list of things that needed to change to improve the relationship with the president." 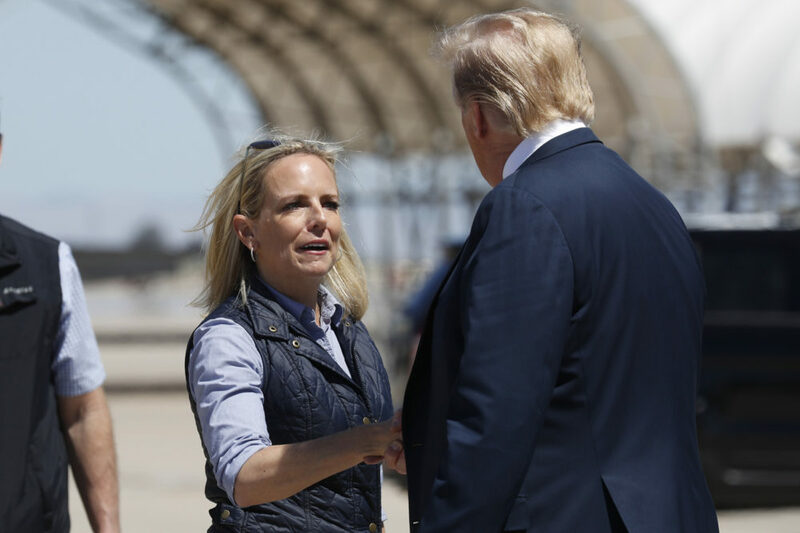 Washington Post: "Homeland Security Secretary Kirstjen Nielsen leaving Trump administration amid surge of migrants" — "President Trump announced Sunday that Kirstjen Nielsen has resigned as secretary of homeland security, marking the exit of a second top immigration official in a matter of days as the White House continues to grapple with an influx of migrants on the southern border. "Replacing her on an acting basis will be Kevin McAleenan, the commissioner of Customs and Border Protection, Trump said Sunday. The announcement on Twitter came shortly after Trump and Nielsen met at the White House, according to two senior administration officials. "'Secretary of Homeland Security Kirstjen Nielsen will be leaving her position, and I would like to thank her for her service,' Trump tweeted Sunday evening. 'I am pleased to announce that Kevin McAleenan, the current U.S. Customs and Border Protection Commissioner, will become Acting Secretary for @DHSgov. I have confidence that Kevin will do a great job!' "
"ICE is already known as the agency that deports tens of thousands of undocumented immigrants who are parents of children with American citizenship. In a particularly cruel separation from November 2017, ICE split a Congolese mother from her daughter and flew the child 2,000 miles to a center for 'unaccompanied' minors, holding her there with limited contact with her mother for four months. Between 2012 and March 2018, there were 1,224 reports of sexual abuse filed by detainees in ICE custody; half of those accused worked for the agency. If such treatment is the agency’s response to undocumented immigrants living mostly without incident in the United States, how much 'tougher' does the president intend to get?" CNN: "Trump is removing US Secret Service director" — "United States Secret Service director Randolph 'Tex' Alles is being removed from his position, multiple administration officials tell CNN. "President Donald Trump instructed his acting chief of staff, Mick Mulvaney, to fire Alles. Alles remains in his position as of now but has been asked to leave. "The USSS director was told two weeks ago there would be a transition in leadership and he was asked to stay on until there was a replacement, according to a source close to the director. "Secret Service officials have been caught by surprise with the news and are only finding out through CNN, according to the source." Allison Pohle produced this show for broadcast. This program aired on April 9, 2019. Why Many Guatemalans Are Leaving Their Home For The U.S.